Thanks to everyone who participated in this body butter giveaway. 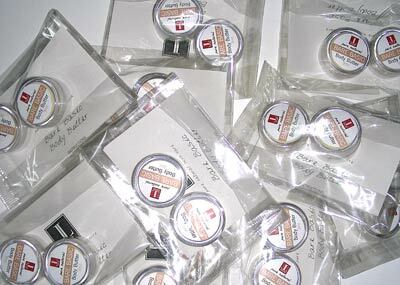 Here are the butters – all ready to go and each equipped with a secret code sticker on the bottom (for an explanation of the secret code, please see the original post). As promised in the last giveaway, Lene and Lana were automatic winners for this 'round', so we needed to find 8 names. 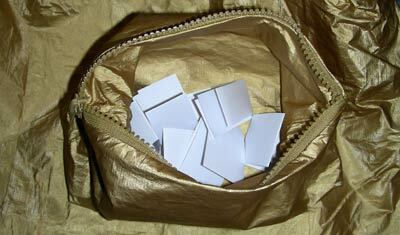 To choose the winners, everyones comment was printed out, folded and placed in a fitting receptacle. 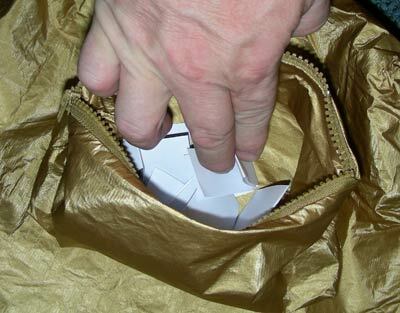 Golden body butter deserves a golden surround – this gold make-up bag with matching shopping tote was my choice. I asked my (completely unbiased and neutral) husband to pick 8 names, which he did – thinking neutral, unbiased thoughts the whole time. But I couldn't make him look the other way this time because, as you can see, the bag is not very big compared to the size of his hand. And here are the names he picked. Yay! Congrats to Alicyn, Amy, LiisK, Laura R, Lil' M, Triin, Kerli and Rikke! Please email me your postal address and your body butters will be in the mail as fast as I can package them. I will look forward to everyone's feedback on these butters! Meantime, I wish you all a great weekend! With the luck I have perhaps I should go and get lottery tickets too :D, thank you! Liis - go for it! And promise to tell when you have won the lottery! Hurra!!! Looking forward to test the butters!! Yay! So excited to receive these butters. Very anxious to give them a try. Thanks.